John Hannafin is a dreamer and impressionist oil painter who seeks to connect with his fellow beings and express life's beauty through uplifting colors, energetic brushstrokes and inspired artwork. Growing up in West Chester, Pennsylvania, Hannafin has had a deep love for drawing and art from a very young age. Though he majored in economics and didn't think it was possible to be a professional artist, he learned to paint and pursued his passion full time after working in a cubicle, selling cubicles. While creating an art publishing business representing other artists, he developed his own personal style and eventually focussed whole heartedly on his art. 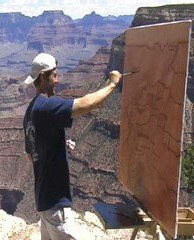 In 2007, Hannafin began an on-going project, *Art Across America*, where he travels around the country painting and filming national parks. His adventures and artwork have been featured on NBC, ABC, Fox News, Public Television and in several print publications. This evolved into several shows at the Chester County Historical Society, a hardcover book and DVD, a children's book, and extended creative journeys to Arizona, Florida, Ireland and Iceland. The artist is also known for his unique interpretation of historic Chester County architecture, often twisting and turning his subjects to imbue them with a sense of spirit and character. Inspired by music, nature and many artists of the past and present, John Hannafin seeks to follow his heart and make meaningful, original and authentic creations that uplift, soothe and inspire others. PA Small Business Dev. Ctr. "Success Story"